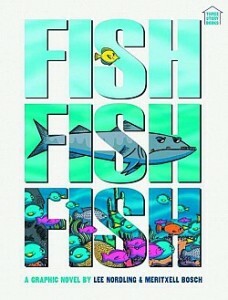 Fish Fish Fish is a new full-color wordless “graphic novel” for young readers, plotted by Lee Nordling and illustrated by Meritxell Bosch. It goes like this: ” A little yellow fish swims alone in a big ocean. A hungry barracuda searches for something to eat. A school of fish band together and find strength in numbers. Under the waves, every fish is a hero in its own story. In this clever wordless comic, Lee Nordling’s simple storytelling engages young readers and provides a gateway into understanding multiple perspectives and points of view.” It’s published by Graphic Universe and available now at Amazon.